Yes, you can do symbolic math in Python! The library to take a look at is SymPy. Its official website is SymPy.org. This article is not a SymPy tutorial, as I only want to walk you through some examples to show you the kinds of things that it can do. A good place to start if you want more information is the SymPy Tutorial from the official documentation. 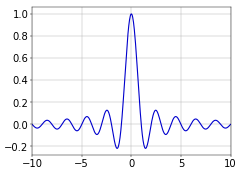 This is the normalized version that is typically used in signal processing. It is normalized by multiplying \(x\) with \(\pi\). The effect of this is that the integral becomes one instead of \(\pi\), and that the zeros of the function are (all the non-zero) integer values of \(x\). The central part of the normalized sinc function is shown in Figure 1. Figure 1. Normalized sinc function. In the code fragment that follows, I’ll define the sinc function in SymPy. There are lots of imported symbols in the first two lines, for the other examples that follow. Note that this result implies that SymPy is smart enough to apply L’Hôpital’s rule, because the limit expression also results in the indeterminate form of \(0/0\). If you want to apply L’Hôpital’s rule manually, you can compute the derivative of the numerator and of the denominator and then compute the resulting limit. This is the expected result. Note the cute use of oo for infinity… Anyway, do remember, for when the need arises, that you can use Python for symbolic math!